PDGA: Is it Fact or Fiction? Nearly every PDGA tournament has them, the self-proclaimed PDGA police who know every rule about disc golf. Today we are putting it to the test; are the rules they are citing fact, or are they fiction? This Q&A is in no way, an official representation from the PDGA. This myth busting is according to our researched interpretation of the PDGA rules. If you have thoughts to add, we’d love to hear them below, unless you are simply an angry troll. If you have a tendency to be a troll, find a different way to present your thoughts, and then present them. (To clarify, this question is asking if you must use a mini to mark your lie, prior to your next throw). You may leave your previous throw on the ground and treat that as your lie, so long as it meets the following criteria: the disc naturally fell in a definite position, it is not elevated, and no casual relief is needed (Rule 802.03-B). If your disc did fall into any of that criteria, you must mark your lie. You may choose to mark your lie if your lie is in bounds, but within one meter of out of bounds. Essentially, most throws will likely not require a mini to mark your lie. However, using a mini may be to your advantage, therefore it is a good common practice. #2 Fact or Fiction: You cannot throw from out of bounds. You must have all supporting points in-bounds (Rule 802.04-B-3). #3 Fact or Fiction: When you mark your lie, the object used must be a mini marker disc. The wording on this can be a bit confusing, as the the rules state “a mini marker disc may be used” (802.03-B, emphasis added). The word may is in reference to if you need to drop a mini at all, or use the original disc as the lie. All other language in the PDGA rule book states “mini marker disc” for when marking your lie with an object may be necessary. #4 Fact or Fiction: Your feet cannot come off the pad when you are teeing off. The rule states “Supporting point contact outside the teeing area is allowed if it comes before or after, and not at, the moment the disc is released” (802.01). The question, however may need additional clarity. Your supporting points must be in bounds during the release. That means that a run-up which takes you off of the tee-pad is OK. It also means that one foot may be off the ground, in front of the tee-pad, so long as the disc is released before that foot comes into contact with the ground. Disc golf may need instant replay to properly rule this one. Until that is allowed, if a supporting point is outside of the tee-box during release, it will have to be called by somebody other than the thrower (802.04 E and F). This also means that if you don’t like where the tee-pad is located, you cannot tee of from the side of the pad. #5 Fact or Fiction: It is impossible to foot fault on a drive. #6 Fact or Fiction: You may call a foot fault on yourself. There was a time when this was true. However, because a foot fault may work to your advantage on an errant throw, it is not allowed to call a foot fault on yourself (8020.04 E). The away player throws first. However, “To facilitate flow of play, a player who is not the away player may throw if the away player consents.” (801.05 D). If a player throws out of turn, without consent of the away player, it may be called a courtesy violation. #8 Fact or Fiction: Do you have to tee off by lead score? A penalty applies, but it depends on the players intention. Unintentionally did not hole out: It is the number of strokes made, plus three penalty strokes. For example, if you forget to place your disc in the basket on a 1 foot putt. One stroke for holing out, and two for the misplayed hole. #11 Fact or Fiction: If a player lands in casual water he MUST play it from that position. #12 Fact or Fiction: If your disc is in a tree and is not retrievable you get penalized a stroke. If the disc is retrievable or not is not a factor here; whether the two meter rule is in play, and if your disc came to a rest above the two meters is the only factor. #13 Fact or Fiction: If you tie with somebody on a hole, the order of play is changed, in favor of the player with no penalty throwing first. #14 Fact or Fiction: A player must write his totals and initial on his or hers scorecard before turning it in. This is demonstrated in the PDGA Rules School Video “Rules School – Demonstrating Balance – Putting”. Forward to the 1:40 mark which is example A-1. #16 Fact or Fiction: Players must watch a fellow group member’s throw. “Players should watch the other members of their group throw in order to aid in locating errant throws and to ensure compliance with the rules” (801.04.B, emphasis added). The language the PDGA uses is “players should…”, not must. The rules then go onto further explain that a player who refuses to help search for a lost disc would incur a courtesy violation (801.04.D). Therefore, if watching the flight of a disc, or watching the players performance to monitor any breaking of rules is expected of players, then a repeat courtesy violation offender may be justified penalty. While debatable, this rule seems to ultimately encourage players to be actively involved with their groups tournament play. If you are oblivious of others actions, it should incur you a penalty for repeat offenses. Will it? That may be up to the tournament director. #17 Fact or Fiction: You incur a penalty for landing in the wrong basket. “Wrong Target. The player has holed out on a target that is not the target for the hole being played. If no subsequent throw has been made, play continues from the resulting lie.” (803.03.G.2). Essentially, the player has been penalized enough by playing to the wrong basket. They then continue their play to the correct target, totaling all strokes taken to hole out at the correct hole. If a player played to the wrong basket, and has then teed off for the next target, a two stroke penalty is incurred. It would seem most logical that a “Failure To Hole Out” penalty would apply (which adds three strokes of penalty), but the rules explicitly state that it is a two stroke penalty. #18 Fact or Fiction: Discs which land on top of the target are considered in. This is one of the most discussed, and should not be debatable at this point; however, new players enter the sport daily, and many-a-player have seen discs come to rest atop the basket, so it is a worthy question. #19 Fact or Fiction: A single blade of grass under your disc, qualifies it as in bounds. An object which is connected from in bounds, towards out of bounds, does not make everything under the object in bounds. As disc golf becomes undeniably more popular, more discs enter the disc golf scene, vying for space in disc golfers bags. These facts about how many discs are being approved today, vs just 10 years ago may blow your mind. According to the list of PDGA approved discs (found here), the first approved disc was in 1964. That disc was named, according to the sheet “Professional” and was made by Wham-O / DTW. Twenty three years later, at the end of 1987 that number had grown to 71 approved discs. Fast forward to 2013. 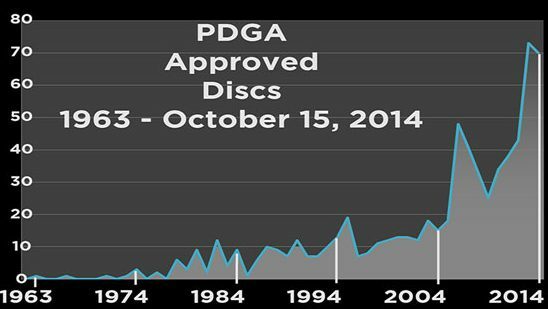 In 2013 alone, there were 73 PDGA approved discs, and as of October 15th, 2014 there are 70 PDGA approved discs in 2014. Since January 1, 2013 there have been 143 PDGA approved discs. In all, there are 686 PDGA approved discs. Nearly 21% of approved discs in the market, have come within the last two years. This does not take into account the large number of discs which were once approved, but no longer in production. Were currently produced discs only taken into account, the percentage would be much higher. One final way to look at how disc production has changed, is to view the average number of discs approved per year, during a given decade. .2 discs per year, or 1 disc every 5 years. (To Date):51.6 discs per year. In the history of PDGA approved discs, 48 different brands have produced discs all time. Within the last two years (after October 15, 2012) 27 of those 48 brands have produced a new approved disc. 21 brands have not produced a new model within the last two years, either because they no longer manufacture, or they have not expanded their lineup. Within the last two years, of the 27 that have made an approved disc, 14 of those brands had never created a disc previously. Over half of the brands creating new models today, did not exist before October 2012. With this many new models and new brands, is it good for the sport? History shows us that not all of the molds being produced today will remain in production. Will discs be moved to “out of production” more quickly, because more discs have entered the market? Or is there room enough for all of the new molds being released, especially when considering industry growth in general? Do you like the additional selection, or do you wish we were back to the days of ? How much of your bag is comprised of these new molds? From the brands which are older than two years, and have not produced any new discs, do you own or use any of their discs? If so, which discs? After the Maple Hill Open last week, Paul McBeth posted on Facebook about the depth of tournament payouts. He stated that he felt that a player who performed far worse received compensation far above what it should have been, especially when compared to the scores of those who competed at a higher level. I can’t recall the words exactly, it looks as though the post has since been removed. In other words, those who placed near the top took less because the payout was spread across a broad number of people. Paul was both negatively blasted and praised for his comments. The payout depth is the percentage of competitors who receive a payout. 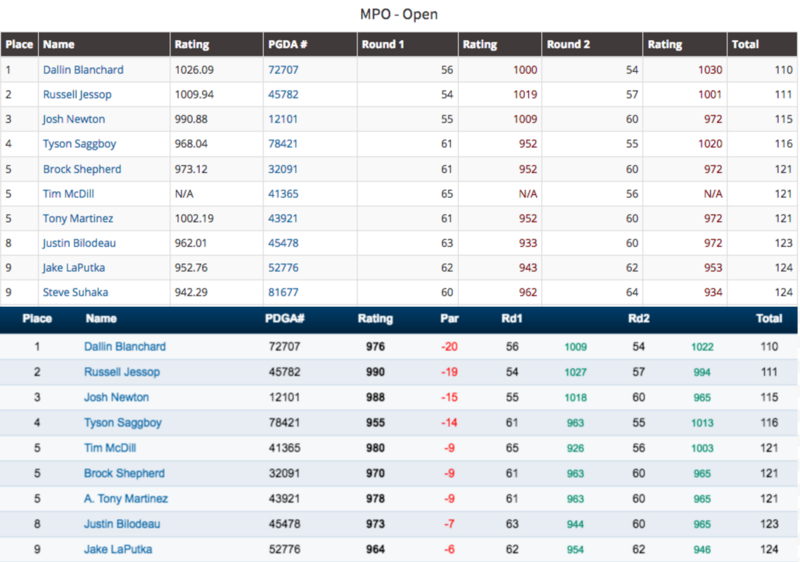 You can view the PDGA “Pro Payout Table” here. Clicking the link will prompt you to download a .xls file. With this scale, the top 45% receive a payout. The last 20 paid receive 37% of the payout. 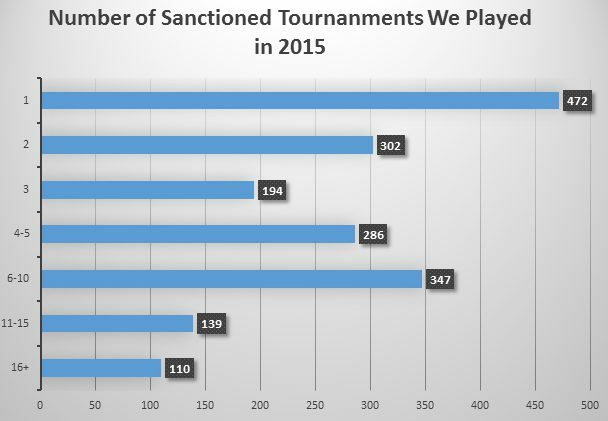 Should Tournament Payouts Promote Champions or Promote More Participation? The argument is that when a regular champion receive more, others are less inclined to take part in the sport. I think that assumption is false. I once lived in Denver, where Sports Authority is headquartered, and became friends with one of the Chief Executives. He and I were lounging on a Sunday watching “ball golf”, and Tiger Woods was on the brink of losing his 5 stroke lead in the final round. With only a 1 stroke difference between him and Woody Allen and two holes left to play, what was once a leisure game of golf became intense. This executive was depending on Tiger Woods to come out victorious. I inquired why, and he said that when there is a champion which people can cheer for, the sport thrives and sales increase. In the end, Tiger was victorious, much to the relief of my executive friend. I share that story to kick this post off, because disc golf needs a Tiger Woods. Yes, for sales. Money coming into disc golf is a good thing for places like Infinite Discs; I’m not going to hide that. So if you feel I’m bias, that’s why. But it’s more than just dollars and cents. Champions are good for the competition, the passion, the structure, and most importantly, the fanaticism. It’s what we love in sports and what keeps us coming back – champions being challenged by underdogs, champions thriving, champions being disparaged by competitors fans, dynasties, and dynasties falling to a new one. This is what enthralls us in a sport and keeps us coming back for more. Why Compete in a Disc Golf Tournament? When players arrive at a tournament they want to have fun, they want to compete, they want to feel the pressure of being at the top, and they want to win. I don’t know anyone who entered a tournament who had already mentally visioned and accepted their fate of taking last place. That player would not show up on competition day. Players dream of and talk about standing atop the winners podium. Nearly every player outside of the touring professionals are underdogs; and that’s understood. In Utah we have the Mello Yello Challenge at the Solitude Disc Golf Course. When Paul McBeth arrives in August to compete after Worlds, each player in his division will be aiming to be on the lead card with him at the end, and then to win at the final round. Who wouldn’t want to play with and score better than the top rated player in the world!? Just to amaze yourself. Then you would realize you’re taking home a giant check, too. When all is said and done, many players scores will fall far outside of those in the winners circle. Most of the players will not be paid. Will they be disappointed and vow never to return to a disc golf tournament? Probably not. If they vow never to return, they probably had more issues than just their score with that tournament. Disc golfers are generally easy-going, happy to participate and compete, own-my-own-results type of people. Will they be a bit bummed that they didn’t play better? Usually they are. If every competitor expected to receive payouts for mediocre or horrible performance, that would be a culture issue that needed to be addressed. Competition is not about making everyone a winner, it’s about rewarding excellence. Many ‘losers’ will go home with stories about amazing shots, flashes of brilliance, and eagerness to improve and compete at a higher level next year – maybe even get into the money… real money, not consolation money as a result of paying a deep field, that wouldn’t even cover gas. By removing payout for those in the middle of the pack and bumping that up to the winners, nobody will be offended. Winners will be properly rewarded, and more inclined to focus on winning and dedicating further efforts to growing the sport (and therefore increasing their competition field… and therefore increasing their future payouts). Those who don’t win will work harder to improve as well. This is one of the reasons why the NBA and I get along less and less. Paul was blasted in his post for wanting more money, with critics saying that he just needs to learn to enjoy the ride. Here’s the reality of most top touring pros right now, including Paul – they’re not that wealthy. These pros stay in the most affordable accommodations available. Prior to competitions, some ask for floor space to sleep on to save a few extra bucks. So yes, money can corrupt the love and passion in the sport… but touring pros are driven by the survival instinct right now. A little extra money to set aside for a home and hotel accommodations while touring is not greedy. We all know the players I’m talking about, the ones who are clearly more advanced than the division in which they are competing. I know some individuals who play intermediate regularly, even though they may take 3rd overall in the tournament. Ironically, if those individuals would have played up another division they would have won more, as the payouts in the more advanced divisions pay fewer people. In this blog post, I am not arguing for modifying amateur and lower division payouts. Continue to keep those payouts flat. In those divisions, reward participation. Keep the top division payouts aggressive, steep, and reward excellence. This, too, encourages players to improve so they can get better payouts. Reality #1: Disc golf is small (even though it is growing). Reality #2: Disc golf is not very profitable (yet). For a sponsor, it’s all about ROI (Return on Investment). A smart sponsor will reach their target audience by sponsoring (which would be disc golf companies like Infinite Discs). Disc golf companies are strapped for cash due to high competition in a relatively small market, and other sponsors hesitate because they want to connect with their target audience and get decent return as well. However, there is no single great way to reach all disc golfers and get a solid ROI. For that reason, the obtaining of sponsors cannot be put squarely on the players shoulders – it actually needs to be put on all disc golfers shoulders. How? Disc golf will continue to grow steadily throughout the United States and the world. Disc golfers need to respect their courses, respect others, and to invite others out to play. At Infinite Discs we try to encourage others to grow the sport through giveaways such as this: #growthesport campaign. On another post I’ll focus on great ways to grow the sport, as well as the best ways to get more courses in your area. Some people have a difficult time with wanting to grow the sport, as it will become more “main stream.” Obviously, I don’t have a problem with that, it helps feed my family and hopefully I’ll be able to save something for a rainy day. I also like to see the sport grow because it’s a fantastic recreational activity for all ages. It pulls people out doors, it brings us to beautiful places in which we live, and it’s a cost-effective answer to recreation for cities. Nothing wrong with having more courses to play within a short driving distance! Let me know what your thoughts are on the article above and what you’d like to see more of! Here’s to next time! 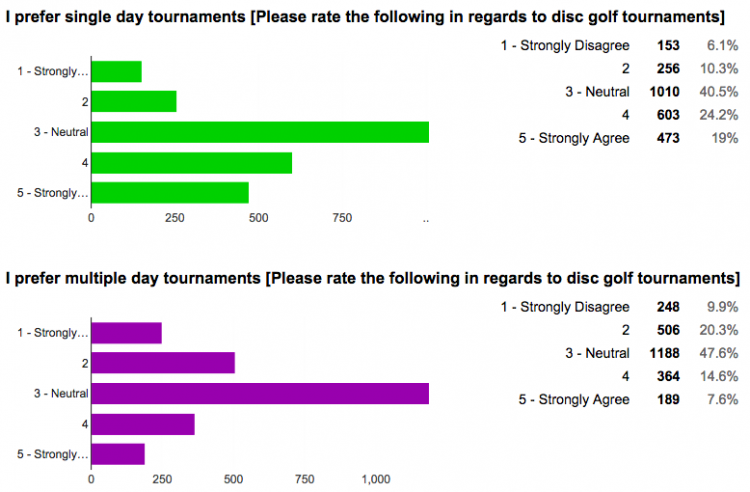 The State of Disc Golf 2014: Membership? We acknowledge and emphasize to you that the results here directly reflect the disc golf community who is in some way, shape, or form, involved with disc golf online. We recognize that it would be inaccurate for us to claim that this survey is a proper reflection of the entire disc golf community. The results portray disc golfers who found this survey via Facebook, Twitter, Reddit, Google+, forums, E-mail, and many other means. The PDGA (Professional Disc Golf Association) is the governing body of disc golf. For an annual fee of $30-$75 a person may become a member of the PDGA. Information on joining and benefits are found at these links. Benefits and Joining. Of those who took this survey, 1/3 are members of the PDGA. Of the 953 respondents who said they were not currently a member of the PDGA, 41% said they intend to become a member of the PDGA, 47% were unsure, and 11% do not intend to become a member of the PDGA. Just as a majority of players (as shown in the previous article) have been playing disc golf for a relatively short time, respondents have also been members of the PDGA for a short time. 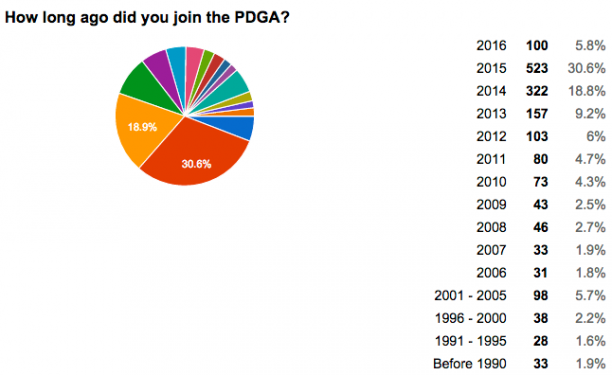 Of the 468 who said they are members of the PDGA, 80% (373) have been members for three years or less! 5% have been members of the PDGA for 10 years or more. Aside from the governing body of disc golf on a national level, there are hundreds of smaller organized groups which identify themselves as clubs, leagues, and associations. These groups are diverse as they are common (and as you travel the country, they are common). A single area may have one group or many. The group may offer incentives for joining, prizes during regularly (or irregularly) planned play and competition, and organize an ace pot and/or other cash reserves. These clubs also typically host one or several tournaments each year. Clubs may have official logos and gear such as stamped discs and clothing. Individuals most actively involved with clubs may also work closely with city planning and development towards the advancement of disc golf. Club participation was more common than PDGA participation, with 47% of respondents stating they are a member of a club. Of those who are not currently a member of a club, only 8% have been a member before, leaving 92% (691 respondents) who have never been a member of a club. 38% of people who are not club members intend to become a member, 11% have no intention to become a member, while the other 51% are unsure. We dug a little deeper into the statistics and we wanted to know: At what point does a disc golfer become actively involved? Is it the first year, or later once a player has gained experience? The statistics were surprising. 18% of players become involved in the PDGA in year 1, and 32% become involved with a club. By year 3, those numbers have changed drastically. In the 3rd year, 48% of players are members of the PDGA and 50% are members of a club. Unfortunately, around the 5th year, those numbers decline as though there is a “5th year disc golfer participation lull”. From there, the longest standing disc golfers club participation continues to rise, with players who have enjoyed the sport for 26 or more years being involved in a club over 62% of the time! However, PDGA membership gradually drops for the veteran players. For those considering signing up, or for those who are running clubs, cost is always a factor in keeping clubs going. One fourth of clubs have no cost to join. Then the clubs which do ask for any funds less than $10 are hard to come by, only 12% have an entry fee between $1-$10. 37% of clubs will charge anywhere between $11-$20, and 27% of clubs will charge $21 or more to become a member. Of all respondents, only 4 were not sure how much their club charges. While a quarter of clubs may be free to join, chances that they’ll be free during a club round is less likely. 35% of “free to join” clubs are also free during league play while 54% will charge you at least $4 for league play. Of all clubs (not just the free to join clubs), 19% are free during regular club rounds. Nearly one-quarter of clubs have no weekly fee and 47% are under $6. 3% of clubs will charge more than $17 on a weekly basis, those respondents may be confusing disc golf with ball golf. A majority of disc golfers who took this survey (of which, many are active in the online disc golf community) have no affiliation with any organized disc golf group. This is both positive and negative. It’s fantastic because many active disc golfers enjoy the sport; courses are frequently used by a variety of people without obligation or affiliation. However, for the sport to continue its growth, an organized effort on the national and local levels needs to take place. At the same time, a majority of players without any stated current affiliation have stated intention to become affiliated with both the PDGA and local clubs, and a large percentage have stated they are unsure. The reality of today’s state of disc golf is there is growth, and there is potential. Organizations of all levels have an opportunity to effectively reach out and offer value. If organized disc golf bodies do so the sport is poised to rise to another level of competition, professionalism, and fun. [box type=”bio”]The next article in this series will be published on February 11, and will cover Best Discs of 2013.